In West of the Sun, this year's nine Kala Fellowship artists interrogate their everyday lives from a sociopolitical perspective. Miguel A. Aragon's work deals with representations of violence in his hometown of Ciudad Juarez, Mexico. The title "West of the Sun" evokes a sense of something more, beyond the horizon, past where the sun sets in the West. The exhibition of that name currently on view at Kala Gallery (2990 San Pablo Ave., Oakland) features the nine 2014-2015 Kala Fellowship recipients in their artistic attempts to traverse that distance, expanding the realms and understandings of aspects of their everyday lives and cultural backgrounds. Miguel A. Aragon's work makes one of the deepest impressions. Aragon, who grew up in Ciudad Juarez, Mexico, often creates pieces that deal with the Mexican drug cartel wars in his hometown and the ways in which the media depicts death. 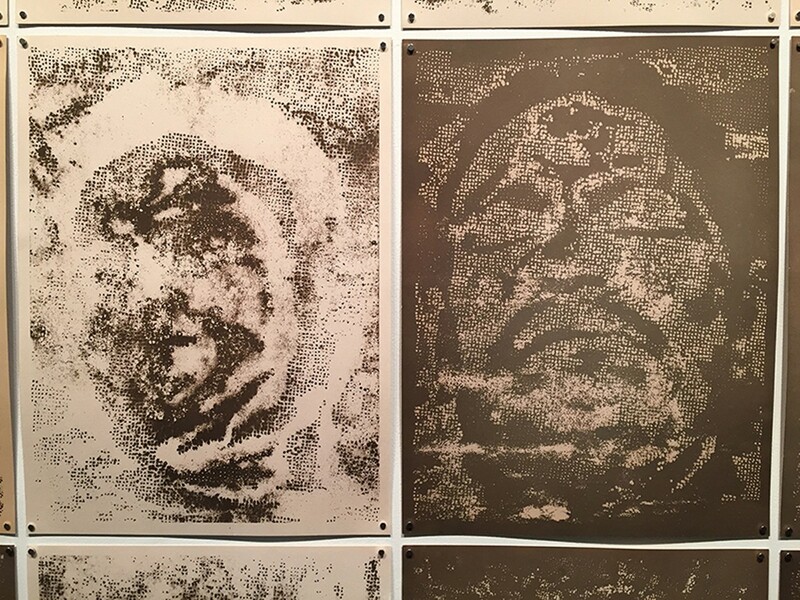 For West of the Sun, he rendered 24 portraits of victims of violence from their pictures in local newspapers by blowing up the images and transferring them onto a screen through a process of puncturing holes, then using that screen as film to expose the image onto cyanotype paper, which he then tinted golden brown. 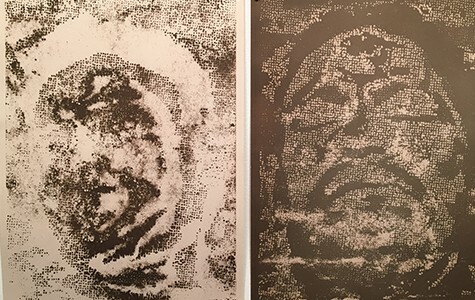 While some of the portraits are recognizable as faces, others are only vague contours of a face, like the impression of a muddy head placed on a piece of paper. Collectively, they appear as a metaphor for the mental imprint that violence can make on a person and the emotional residue that it can leave behind. Zohra Opoku's contribution also examines representation, but by testing the extent to which cultural identity is tied to styles of dress. Opoku, who is both German and Ghanaian, focuses her work on the observation that in Ghana, it has become an accepted norm for nearly everyone to wear second-hand clothes from other countries. In a series of pieces that she calls "THE BILLBOARDPROJECT," Opoku questions what effect second-hand-clothes wearing has on self-perception and self-worth for both individual Ghanaians and collective Ghanaian national identity. The project consisted of five public installations constructed in Accra, Ghana that used unwanted garments from a local clothing market to assemble billboard-like structures that flow in the wind. In West of the Sun, Opoku presents video documentation of these projects that draw the viewer into the on-the-ground experience of interfacing with these garments and call attention to the privilege that underlies ability to buy new clothes based on self-expression. Another highlight from the show is Lea Cetera's piece Trust Your Gut, Jump Off a Cliff, for which she explored open-ended parameters by asking gallery visitors to recite a piece of prepared dialogue, and then rearranging those clips into an "exquisite corpse" video poem that's both humorously absurd and surprisingly profound. Cetera, like the rest of the artists in West of the Sun, bends representation in an attempt to break it open and reveal new meanings and new, thought-provoking perspectives.